Statistics current as of February 4, 2012. Dominic "Donny" Lia (born November 8, 1978 in Jericho, New York) is an American race car driver. He won the 2007 & 2009 NASCAR Whelen Modified Tour championship. He also won the Race of Champions Modified Tour races in 2004, 2005, 2006, and 2007. He has raced on the national level in the ARCA RE/MAX Series (now ARCA Racing Series), Camping World Truck Series, and the Xfinity Series. Lia's father Don owns several car dealerships in the Long Island area. Before he began his racing career, Lia competed in computer racing games online against competitors all over the world. He credits gaming for helping develop his interest in motorsports and for improving his reflexes and his hand–eye coordination. In 1999, Lia began racing a Legends car at Wall Stadium (Wall, New Jersey). He won several times including the track's biggest event, the prestigious Turkey Derby. In 2000, Lia continued racing his Legends car with success all over the eastern United States, scoring over 20 wins. He competed in the NASCAR Modified division at Riverhead Raceway (Riverhead, New York) and he won Rookie of the Year honors in 2001. He also made his NASCAR Modified Tour debut at Martinsville Speedway. The 2002 season was spent gaining experience for a full-time move to the NASCAR Modified Tour in 2003. He placed in the top ten in NASCAR Featherlite Modified Series (previous name of the Whelen Modified Tour) points in 2003 on his way to another Rookie of the Year award. He claimed five poles in 2004, more than any other competitor, which earned him the Bud Pole Award. He also competed on the Race of Champions Modified Tour, taking a big victory in the second-annual North-South Shootout at Concord Motorsport Park in North Carolina. Lia continued racing his Modifieds in 2005, winning two Whelen Modified Tour races and finishing sixth in WMT season points. In 2006, he was given his first opportunity to race in a non-modified stock car. He practiced and qualified for the Nashville Superspeedway event in the ARCA series. He won one event on the Whelen Modified Tour and two pole positions, and he won three unsanctioned events. The next season, he won six Whelen Modified Tour races including the events at Martinsville, 2 at Stafford, Thompson, New Hampshire, and Riverhead. He clinched the season points championship before the final race. On September 15, 2007 he made his first appearance in the NASCAR Craftsman Truck Series. He raced in the Bill Davis Racing No. 36 Toyota at New Hampshire, finishing 20th. Lia had been set to drive for HT Motorsports in the No. 59 Toyota in late 2007, and drove at Homestead hoping for a full 2008 season. However, sponsorship did not pan out, and instead joined The Racer's Group (TRG) for the 2008 season, driving Kevin Buckler's No. 71 The Racer's Group/Nationrides.com/Zurich North America Chevrolet Silverado starting at Auto Club Speedway (he was ineligible to race at Daytona because of minimum driver proficiency rules, with Mike Bliss running the race). He had his first Top 10 finish at Martinsville Speedway when he finished ninth. He scored his first Craftsman Truck Series win at Mansfield in the Ohio 250 on May 24, 2008 by nudging race leader David Starr out of the way on the final lap, which is currently the only lap he has led in his Truck Series career. He was the first rookie to win a Truck Series event since Carl Edwards in the 2003 season. He was the also the first driver from Riverhead, New York to win a NASCAR national series race since Steve Park's final Cup Series win in 2001. Late in the season, Lia was released from TRG, and signed to drive for Randy Moss Motorsports for seven of the final eight races of the season. Lia returned to the Mystic Missile in the Whelen Modified Tour in 2009, winning four times and winning his second championship. 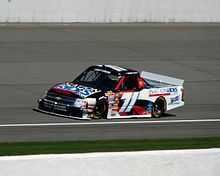 He also made his Nationwide debut at Lowe's Motor Speedway, but finished last in the No. 07 SK Motorsports Toyota Camry. He drove a part-time schedule in the No. 07 and No. 21 Chevrolet Silverados for SS-Green Light Racing in the Truck Series in 2010. He then ran three truck races for Stringer Motorsports near the end of the season. ^ a b c d e f g Barker, Barbara (June 21, 2008). "LIer a driving force". Newsday. Retrieved January 31, 2016. ^ a b c d SS-Green Light Racing (February 10, 2010). "SS Greenlight Racing signs Donny Lia". motorsport.com. Retrieved January 31, 2016. ^ NASCAR (February 9, 2008). "Modified champion Donny Lia joins TRG". Daytona Beach, Florida: motorsport.com. Retrieved January 31, 2016. ^ Randy Moss Motorsports (October 7, 2008). "Randy Moss Motorsports names Lia to finish season". Statesville, North Carolina: motorsport.com. Retrieved January 31, 2016. ^ "Lia, Stringer Motorsports team for Kentucky". Mooresville, North Carolina: motorsport.com. September 1, 2010. Retrieved January 31, 2016. ^ "Donny Lia – 2009 NASCAR Nationwide Series Results". Racing-Reference. USA Today Sports Media Group. Retrieved November 23, 2014. ^ "Donny Lia – 2007 NASCAR Craftsman Truck Series Results". Racing-Reference. USA Today Sports Media Group. Retrieved January 19, 2015. ^ "Donny Lia – 2008 NASCAR Craftsman Truck Series Results". Racing-Reference. USA Today Sports Media Group. Retrieved January 19, 2015. ^ "Donny Lia – 2010 NASCAR Camping World Truck Series Results". Racing-Reference. USA Today Sports Media Group. Retrieved January 19, 2015. This page was last edited on 19 December 2018, at 14:45 (UTC).